Book Review: The Search for Abraxas | Robert Mitchell Jr. I went after this book like a duck after a June bug, mainly because I have been involved in my own search for Abraxas for several months and I wanted to experience alternative perspectives. The first praise I want to shower on the book is that the writing is solid and intelligent, and the volume is well edited. There are no run-on sentences, no typos, and although there is some speculation on the part of the authors, there are none of the lunatic ramblings one often finds in occult books. The volume is in three sections. Section I contains an excellent overview of Gnosticism and Qabalah. For those knowledgeable about neither, this alone is worth the price of admission. 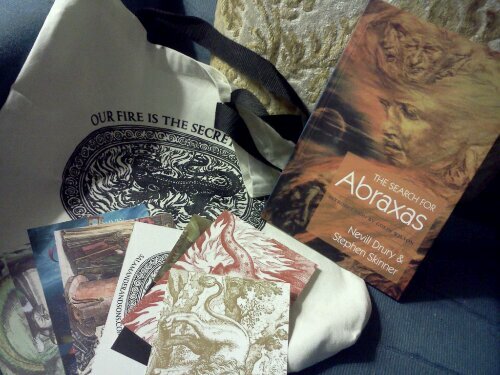 Abraxas, the transcendent Gnostic deity who is good and evil in both extremes, is supposed to be the thread that sews the three sections together. But in Section II, which delves into the work of Austin Osman Spare, witchcraft, and Meso-American mythology, the authors get into the weeds. The thread is lost and the promise of Section I begins to dissipate. Although interesting, this section almost seems to belong in another book. On the other hand, I must say that the color plates (paintings, drawings, etc.) 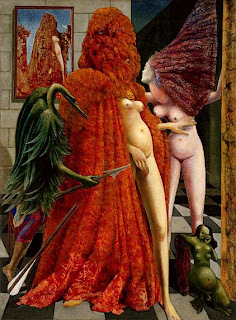 are outstanding, and feature the works of Austin Osman Spare, Harry Clarke, Hans Voight, Edmund Dulac, Wolfgang Paalan, Max Ernst (“The Robing of the Bride” gives me chill bumps), and Drury himself. These are A+. I wasn’t at all disappointed, but neither was I blown away until I contemplated the fact that was written over forty years ago. It is a remarkable book, a ground-breaking book, and for that reason alone it is recommended. It was ahead of its time. This entry was posted in Writing and tagged abraxas, drury, skinner, spare. Bookmark the permalink. Well done! I really got a sense for what is within the binding. Also, it reminded me of my first reading of ‘The Mysteries of The Qabalah’, from Eliphas Levi. Among my father’s “collectibles” in the attic, mixed amongst the Mad Magazines and the original Heavy Metal comic, I found this book, along with an Aleister Crowley. Being interested in prestidigitation, the imagery and “magic” caught me. I soon picked up LaVey, Magick in Theory and Practice, and many others as I began to distinguish between magic and ‘magicians’. Apologies for the long comment, but your review did it’s job! Thanks Mark. You know, you are one of only a few fitness aficionados I’ve ever become acquainted with who have any familiarity at all with occult studies. I’m floored. The wonders of the internet!